The debate continues over how to make our streets less crowded, safer and better for people as well as cars. It’s worth looking at European cities, which have led the movement to make city streets that are as good for public life as they are for driving. In recent months, I’ve visited four of the cities with the most innovative street designs: London, Stockholm, Amsterdam and Copenhagen. American traffic laws require pedestrians to cross most streets in marked crosswalks, and painted and protected bike lanes are all the rage in United States cities today. But in Amsterdam, walkers, bike riders and drivers share the streets. Any pedestrian or cyclist may legally walk or ride anywhere on a vast majority of the streets in the center of the city. 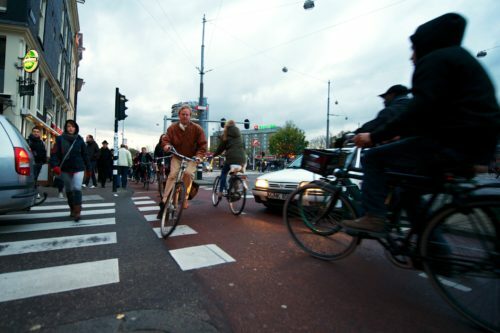 In Amsterdam, walkers, bike riders and drivers share the streets. Credit: Jan Hennop/Agence France-Presse — Getty Images. These “shared spaces” evolved after the 1950s and 1960s, when the Dutch economy boomed after decades of hardship and cars overwhelmed Amsterdam’s streets. In 1954, the Amsterdam police chief, Hendrik Kaasjager, proposed paving over several canals and a part of the harbour to make more room for cars. Amsterdammers fought back. The city had been a cycling capital since the early 20th century. By the 1920s, more than 80 percent of city trips were made on bicycles, but increases in automobile traffic in the decades after World War II led to many conflicts and collisions on the small streets. Traffic deaths in the city rose to a peak of 3,300 in 1971, including 400 children. So Amsterdam’s urban designers transformed entire streets — all the space between the buildings, in other words — into unified “public realms” for city life. Like Amsterdam, Copenhagen in the 1960s had a strong culture of cycling threatened by a booming economy that filled its streets with cars and trucks. 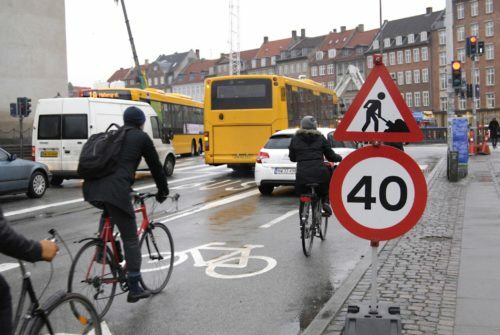 In response, Copenhagen went in a different direction than Amsterdam, making some roads in the center car-free while rebuilding major thoroughfares to give pedestrians and bicycles equal access to the city. In Copenhagen, wide cycle lanes on both sides of the street buffer equally wide sidewalks from traffic. Copenhagen’s planners thought it was both unsafe and uncivilized to allow city traffic to go faster than 30 m.p.h., so they designed streets that naturally held cars to that speed — by narrowing the traffic lanes and keeping the streets two-way. They used the extra space between the buildings for wider sidewalks and broad bike lanes, and they designed the wider sidewalks and new cycle lanes to separate the pedestrians and cyclists from the cars. Typically, the bicycle lanes were a little higher than the roadway but a little lower than the sidewalk. The slight level changes, low curbs and subtle paving patterns physically and visually separated the different areas. Frequently, the designs gave as much or more of the space to the use of pedestrians and cyclists as to motor vehicles. We see examples on many Manhattan avenues, with parked cars sitting awkwardly between moving traffic and grossly striped bike lanes. Every planner and urban designer I’ve talked to in Denmark and the Netherlands says their countries would never build such ugly, over-engineered streets, which diminish the pedestrian experience and give high priority to traffic flow at 35 m.p.h. and above. London and Stockholm came to the problem of making streets for people later than Amsterdam and Copenhagen. As they grew rich in the late 20th century, both cities built urban highways to speed cars in and out, rebuilt city streets to make traffic flow faster and turned city squares into parking lots for the new traffic. But by the early 21st century, congested streets, traffic deaths, air pollution and new ideas about climate change persuaded city leaders they needed a faster fix than the decades-long evolution of policies and designs Amsterdam and Copenhagen went through. 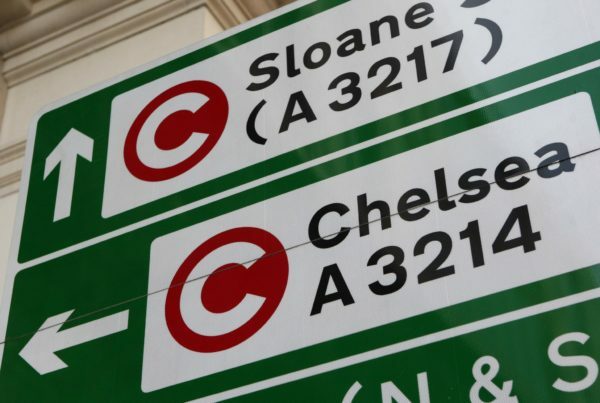 In 2003, London became the first major European city to introduce a congestion zone. Stockholm followed three years later. Today, both cities have less traffic, quieter streets, cleaner air and fewer traffic deaths. Stockholm had a similar but different experience. Facing public opposition, it held a seven-month trial in 2006. A few months later, a public referendum made the plan permanent. Stockholm has a congestion zone with variable pricing based on demand; London has a flat rate that allows multiple entries in a single day. After more than 10 years, Stockholm’s system has proved more effective. London, one of the most expensive cities in the world, has too many people who simply pay the flat fee, which has been raised over time but not enough. London also shares New York’s problem of congestion caused by Uber. But planners, engineers and urban designers in London and Stockholm have used the eventual popularity of the congestion zone and the public focus on better streets to jump-start new designs for shared space, pedestrian streets and cycle lanes. New York can do that too. “We’re not Amsterdam” is something people like me who work for better streets in America sometimes hear. Everyone reading this grew up in the age of the automobile, but in Manhattan and many other cities and towns around the country, walking is the new driving, and we’re ready for something different. Sixth Avenue in Midtown Manhattan. Governor Cuomo has proposed congestion pricing for driving in Manhattan below 60th Street to alleviate congestion and help pay for public transit. CitiBike is the largest bike share system in America. Almost 80 percent of Manhattanites don’t own a car, and that percentage increases every year. Eighty-two percent of New York City residents support Vision Zero, with good reason: Pedestrian deaths have gone down every year since the city began Vision Zero work, and last year there were 32 percent fewer than in the previous year. The number of bicycling deaths has gone up, however, because more people are cycling. 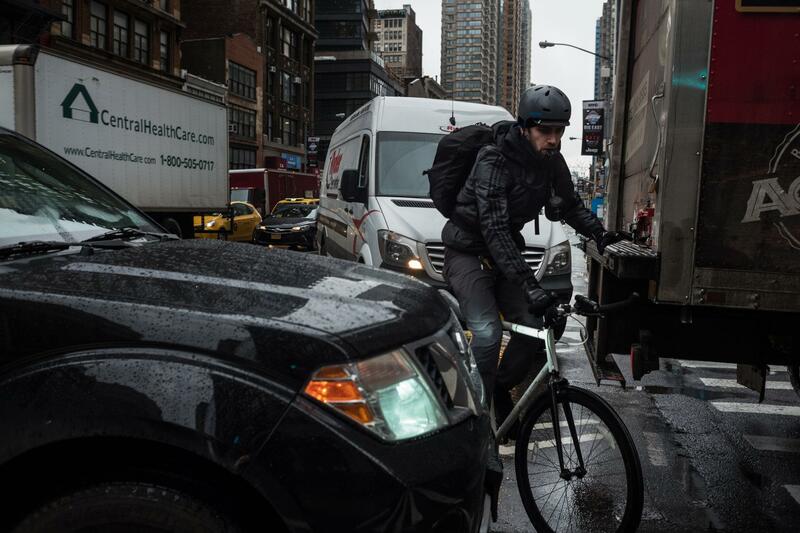 And while the protected bike lanes on Manhattan’s avenues are a step forward, they are still a compromise, with too much emphasis on traffic flow. The new design for transportation corridors with bike lanes introduced left-turn lanes all over the island, and those are dangerous for pedestrians and cyclists alike. 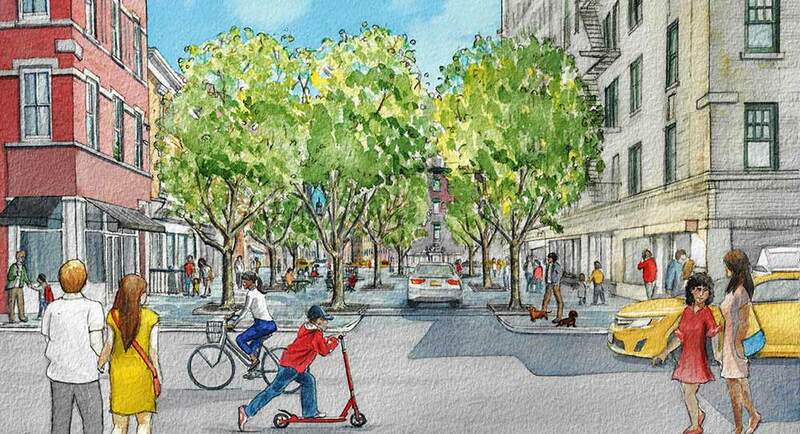 New York City’s Department of Transportation has led the American movement for better streets. But as long as we build streets that encourage people to drive into the city and to move around it at 35 m.p.h., we will never get to zero deaths. Our streets are safer, but they’re not safe. They are part of an American driving culture that produced 40,000 traffic deaths last year. 1. Decrease the number of Manhattan streets that function as transportation corridors primarily devoted to moving machines through the city. 2. Design and build Slow Zones where people actually drive slowly. 3. Make the transportation corridors that remain better urban places, with a better balance between city life and moving cars. New York may never be Amsterdam, but the Financial District — which was once Nieuw Amsterdam — has narrow, crowded streets that with just a few changes here and there could be wonderful shared spaces. The small streets of Greenwich Village also came before the Manhattan grid, and the Village too could be a walker’s paradise with just a little work. Manhattan real estate is too valuable and rare to devote a majority of public space to moving traffic. History shows that if we make our city streets easy and safe for speeding cars, we will attract so many cars that the streets will be crowded, polluted and unsafe. European cities show that if we build streets for people, we will get better places for everyone.